Missionaries Rev. 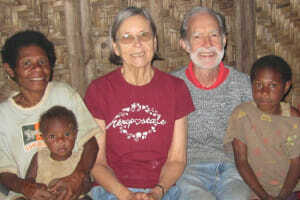 John and Maila Davies met while preparing for overseas mission service. After they married, they worked in Papua New Guinea. They established their home in a remote mountainous region among the Kobon people, where they raised their children, gave medical help to the people, and analyzed the sounds of the previously-unwritten Kobon language to develop an alphabet. Using this alphabet, they produced primers and other materials to teach people to read and write their own language. They helped to establish Christian schools and train some of the graduates to be teachers, administrators and staff in new schools. In 1986, John and Maila expanded the work into a neighboring language group, the Haruai. In 2006, they started in a third language group, the Minimib. The Kobon received their beautifully illustrated New Testament in 2006, the Minimib in 2009, and the Haruai in 2010. Today the Davies’ main focus is running Christian “Living Word Schools” for the Haruai, Kobon and Minimib. Reading is taught using books of Bible stories. There are now more than 30 of these schools, with about 1,000 children now receiving a free Christian education for three years. There are also several adult literacy schools. The Davies’ goal is to reach a generation for Jesus. They plan to record the three New Testaments they have translated, and distribute solar-powered players so that people who cannot read can hear the Word of God. Their ministry brings the Gospel to people for the first time.